Narrow laneway location. Minimalist warehouse chic fitout. Specialty coffee. 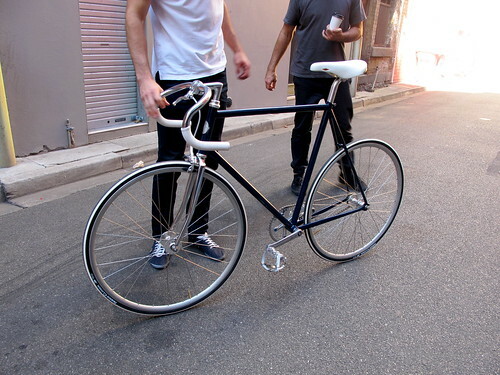 Custom-made fixies. Drinking water out of jam jars. Men with neatly trimmed beards and cutely-bespectacled girls wearing dresses and cardigans, sitting on milk crates. Seriously, could this cafe BE any more Melbourne? No I don't think so. 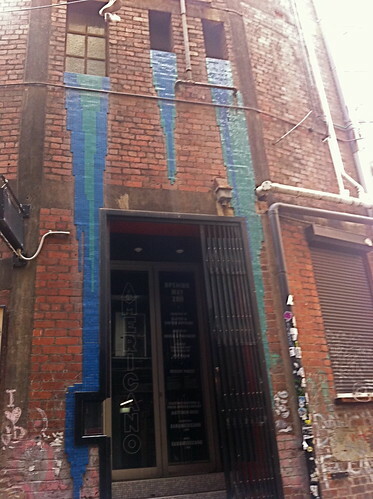 While it would look equally at home in the vicinity of Gertrude Street, the laneway in question is in the CBD (near Brother Baba Budan). 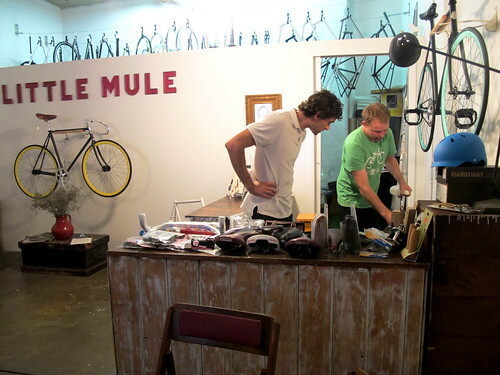 And yes, The Little Mule is a combination bicycle workshop and cafe, run by a trio of bicycle/coffee nerds. My former work colleague, the charming J, invited me to lunch there a couple of weeks ago: he was very excited as we'd be collecting the bike The Little Mule had custom-made for him. My initial fears that the cafe might be a bit too cool for school were swiftly allayed by the friendly, enthusiastic staff. Most of the seating in the cafe apart from the comfy couch is at communal tables and the menu is compact, consisting mainly of melts, toasted sandwiches, baguettes and a seasonal salad or soup. I ordered the $10 sandwich on the specials board because hello, PULLED PORK. 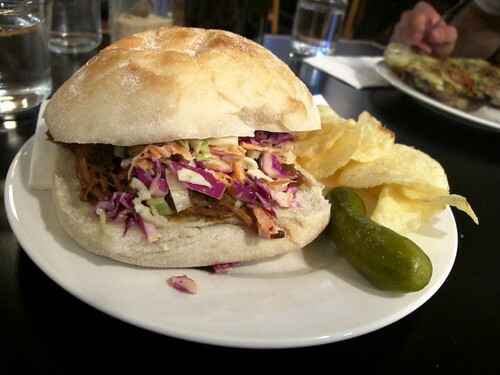 Moist 12 hour slow cooked pulled pork with coleslaw in a roll, served not only with crisps (as at De Clieu) but also with a pickle! Delicious. 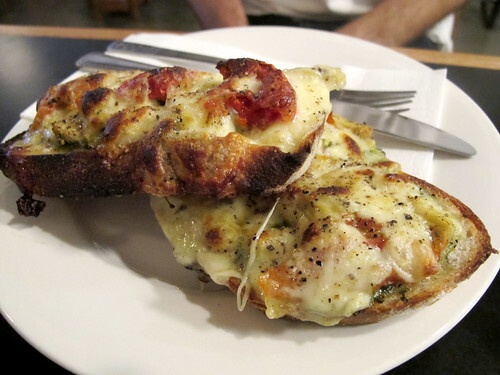 J ordered a melt - I think it was the $8.50 one with semi-dried tomato, artichoke, basil pesto and scamorza. 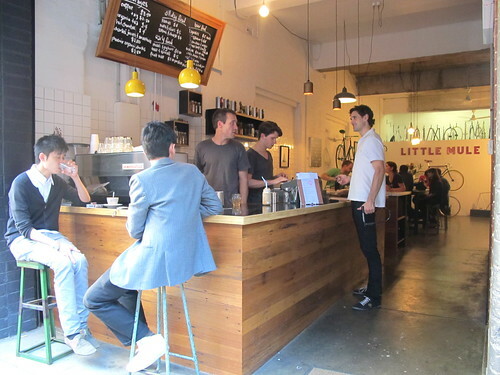 The coffee beans at The Little Mule come from The Little Marionette, a Sydney cafe I visited way back in January 2008. I discovered to my great interest that The Little Mule also uses The Little Marionette's recipe for their sensational banana bread. Must try it next time I'm back in that part of the city. My handlebars are ‘Nitto Track’ NJS approved and so are my pedals. The colour scheme is midnight blue with white handlebar-tape and white leather saddle with a completely chrome fork (I think you’ll agree that is a nice little touch). The frame of course, is made and designed by Little Mule. Japan's unique event, Keirin racing, is very strictly regulated. Because Keirin is run by a Japanese government agency and because Keirin's raison d'etre is actually gambling (proceeds from which fund Japan's schools), it is absolutely critical that the equipment be standardized, uniform and dependable. Certified Keirin components bear the NJS Keirin Approved label. I must admit, it's an extremely handsome bicycle. More pictures are on The Little Mule's blog. 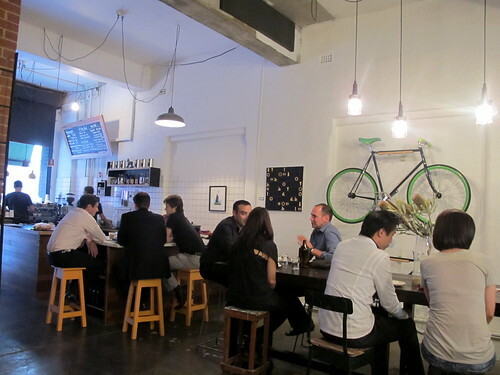 Just when you thought the city's laneways couldn't get any laneway-ier, along comes sibling bar to Der Raum, Bar Americano (opening late May). 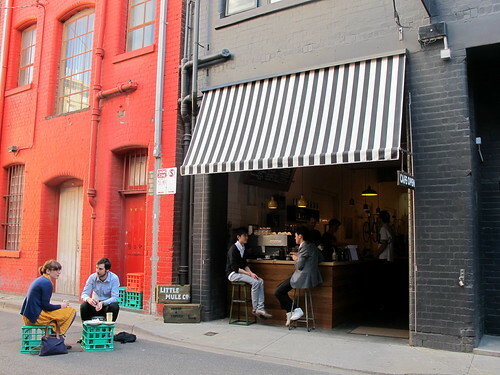 It's tiny, hidden in a tucked-away laneway off another laneway (giving its location a Croft Institute degree of difficulty), and will be serving espresso by day and old skool cocktails by night. Yessssss. I love this post. The Little Mule looks so cool. Kind of reminds me of Captains of Industry, in that it's not only a coffee shop, but has other cool business there also. 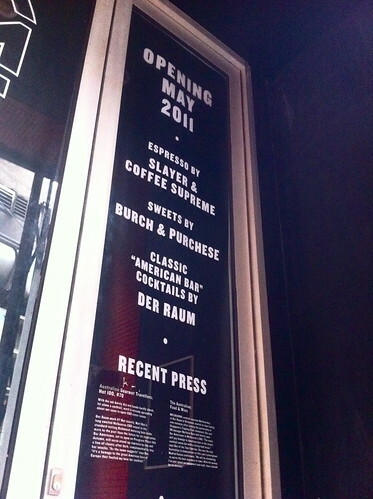 Super excited about Bar Americano opening. I like your blog. I love Melbourne too! so melbourne, indeed! looks right up my alley... had a friend build me a custom fixie but has since moved out of town and it needs a few repairs. why not drop it off there and grab a coffee, eh! great recommendation. thanks for sharing. Little Mule is great - We usually end up there since BBB is almost always packed out. And the banana bread is KILLER! Seriously, the best I've had. Another good BBB overflow spot is Manchester Press, one lane over in Rankins Lane. Very cool fitout and they seem to specialise in bagels. I've only had their coffee which was pretty decent - Brewed in QLD I think, called 8oz. Sounds very quaint! I shall pay them a visit! Thanks Juju, glad you like. EM, did you like it as a work meeting venue? The tables are communal, but the place is nice a spacious so I thought it'd work well. No worries yasmeen, hope they can help! 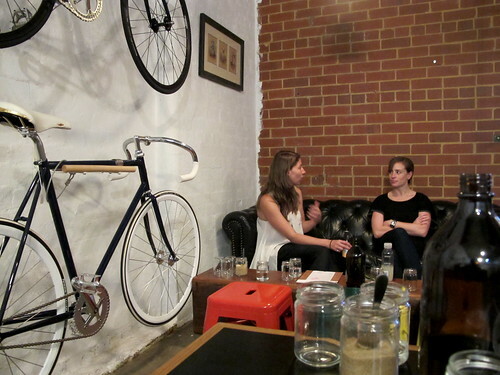 Coffee and fixies in a laneway! I am so there, just let me squeeze into my stove pipe jeans! Am loving the look of the little mule!! Those hipsters on milk crates look sooooo cute. They would look great in my courtyard.